PLEASE NOTE the NEW times of Morning and Evening Prayers now from 7.30am and 5.30pm. No Evening Prayers on Monday, Thursday, Friday nor Saturday this week. Holy Hour & Benediction will be as usual on Wednesday, followed by Fish Supper and Conference. Week of Prayer for Christian Unity takes place this week. Please of your charity pray for the unity of the Church universal and all those committed to Christ. Main Photo: the moment of Benediction during Holy Hour, held every Wednesday from 5.30pm. Epiphany House Blessings: if you would like your home blessed with Epiphany water and your doorways chalked with the initials of the Magi in blessing for the new year, just let the clergy know! Kamal Abdullah proudly displays his NVQ Level 2 Certificates in Catering gained through his apprenticeship with Cherubs Kitchen 2015-2018! A refugee from Somalia, Kamal came to the UK aged 16 separated from his siblings after witnessing their parents being murdered in the civil war, he was put into child care until he was 18. After a decade on the streets fending for himself illiterate, innumerate and suffering from PTSD, falling in and out of drug and alcohol addiction, he was referred to our apostolate, Cherubs Kitchen for a work experience placement. 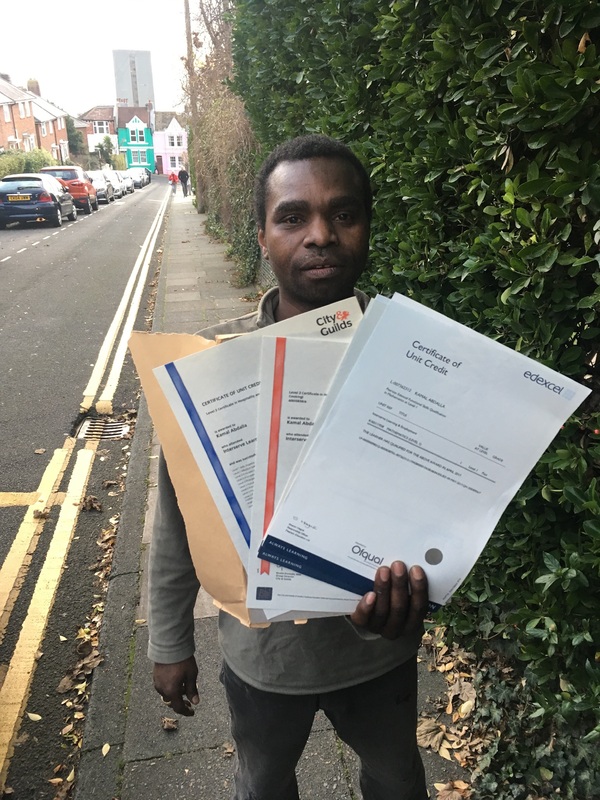 After six months of coaching by Fr Jerome he passed the minimum requirements for literacy and numeracy to begin the NVQ Apprenticeship and at Easter 2018 completed the course. However, due to a break in his learning through illness, it took sometime for the assessor’s to calculate Kamal’s final result. However, his certificates came through this month and we were delighted to discover he’d passed! Colin Reed (Barbara’s son) one of Cherubs volunteer chefs who had helped mentor Kamal, gave him his certificates. Revive & Renew Conferences on Personal Holiness if you missed them or would like to hear them again are presented below via YouTube. The new series for Epiphanytide has already begun, on Wednesdays following Holy Hour and a dutch Fish Supper!